I like to eat seasonally, and locally, which usually means that I'm eating fruits and vegetables when they are at their peak flavor. No tasteless January store tomatoes for me! For berries, however, that means my "eat them fresh" season is very short--weeks, at best. Most of the berries we eat have been frozen and put up in the fruit and veg freezer during the season. We put frozen berries in fruit salads, on oatmeal, and waffles to name a few. My spouse and daughter even like a bowl of frozen berries for a snack or dessert. Me? I like to bake with them. I don't care if the berries lose their shape when they thaw in a muffin or cake batter. They still taste fine to me! I needed a muffin to take to a morning coffee gathering. I'd been gathering pizza ingredients out of the fruit and veg freezer when a bag of raspberries caught my eye. Dark chocolate and raspberries go well together, so the recipe was starting to form in my mind. My mom had emailed me to use cocoa powder in another dish, and I always listen to my mom ;) so I added a couple of tablespoons into the batter. Then the fun began. I used my standard soaked oatmeal muffin recipe as the base, but the first batch wasn't quite right. I suspected the culprit was the additional bitterness of the cocoa powder, and made a second batch using a bit more brown sugar. That tasted good. But now I had 22 Chocolate Raspberry Soaked Oatmeal Whole Grain muffins staring at me. Eep! 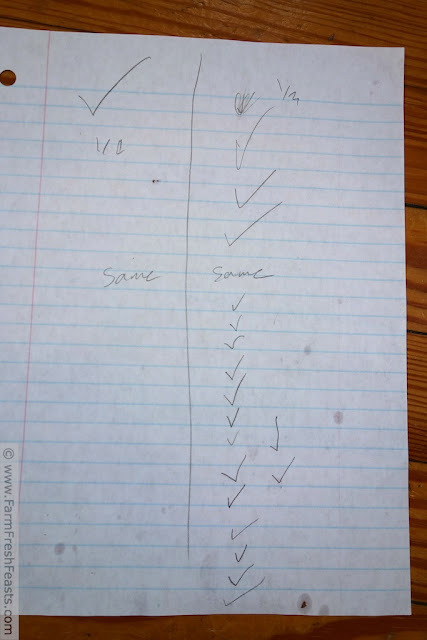 Conveniently, my daughter had recently enrolled in a home ec practical arts class, so I emailed her teacher and asked if the class could do a taste test for me. The teacher was happy to oblige. My daughter came home for lunch and I sent both batches of muffins off with her. The class verdict? Overwhelmingly in favor of the slightly sweeter muffin. The actual data sheet, grease stains and all! That meant that I still had no muffins for the morning coffee. When I made my third batch of chocolate raspberry muffins for the day, I tossed in a handful of dark chocolate chips to the batter. I liked these best, and that's why you're getting this version. Immediately after mixing, after 1 hour, after 3 hours. This recipe calls for soaking the oats in buttermilk for a while. I know it's hard to do on a busy morning. 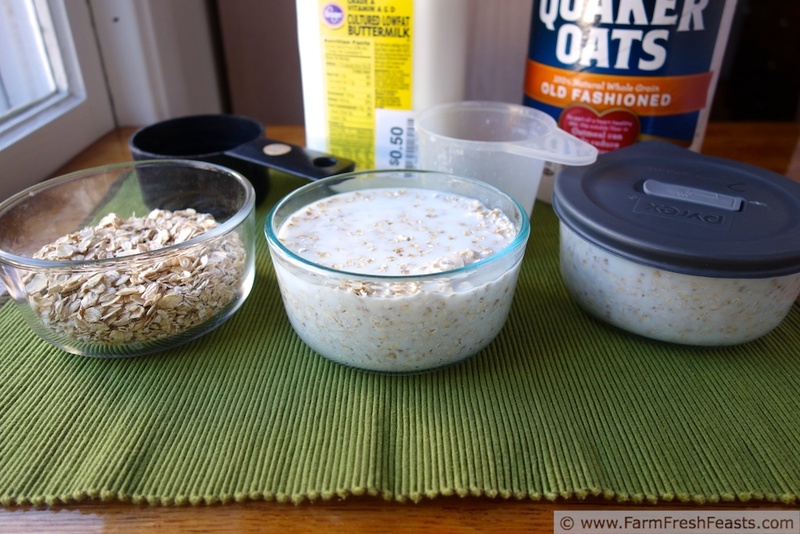 Sometimes I roll out of bed with the alarm, stumble into the kitchen, throw a cup of oats into a bowl, pour a cup of buttermilk on top, give it a stir, then go shower and get ready. Other times I throw them together as I'm cleaning up after dinner and leave them out on the counter overnight. And sometimes my spouse freaks out about the counter idea, so if he's not deployed I move the bowl to the refrigerator overnight. 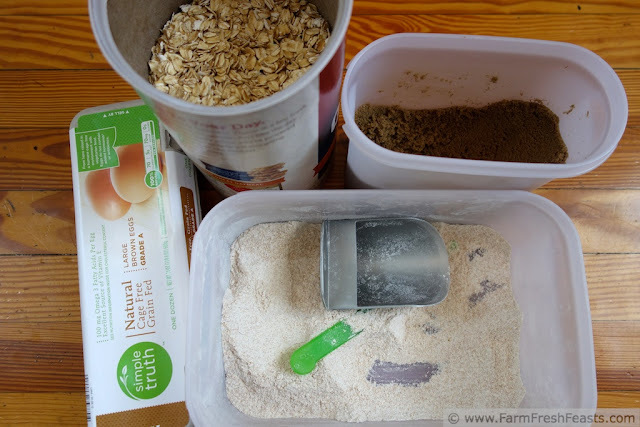 I've even combined a cup of buttermilk and a cup of oats each into 3 lidded containers on a Sunday night, while I was thinking about it, so I could make muffins all week long. I wanted to show you what the oats (raspberries) and buttermilk look like freshly mixed, then after an hour, then after 3 hours (after that I went ahead and baked the muffins as I was losing my light). If left even longer, the oats completely disintegrate into a fairly smooth batter. Other folks have scientific reasons for soaking oats in buttermilk, but I've not done the research. I can just tell you it makes my muffins a delicious way to eat whole grains. In a large bowl, mix oats, buttermilk, and berries. Set aside for at least an hour, up to overnight (See NOTE below). When you're ready to bake, preheat the oven to 400 degrees Fahrenheit and spray a standard 12 hole muffin pan or 24 hole mini-muffin pan with oil (or line with cupcake papers). Add egg, oil, and brown sugar to the bowl. Mix thoroughly. Dump dry ingredients on top (cocoa through salt) mix until nearly combined, then add chocolate chips and mix until just barely combined. Scoop** batter into prepared pan. You should get 12 standard size muffins or 36 mini-muffins. 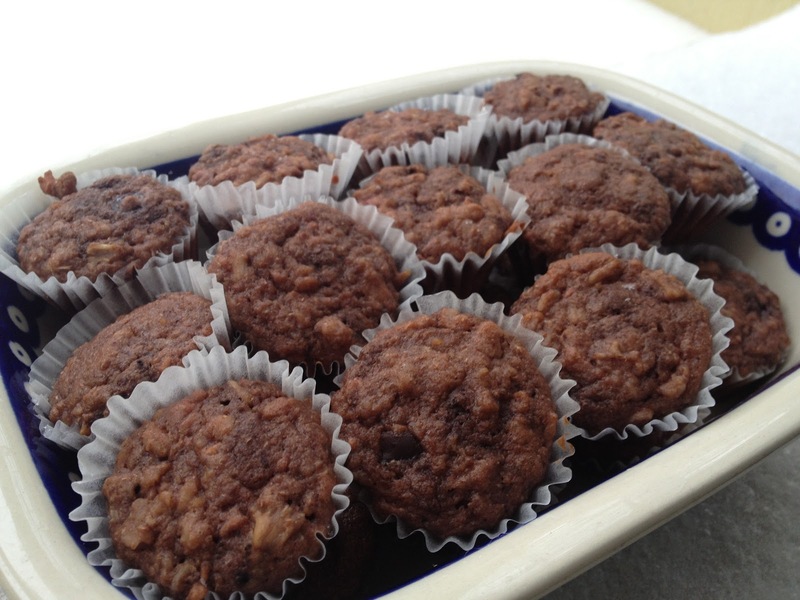 Bake 15-18 minutes for standard size, 12-15 minutes for the mini-muffins. Cool in pan 5 minutes, then finish cooling on a rack. **For standard size muffins, my scoop holds 3 Tablespoons (1 ½ ounces) by volume, though the muffin batter is mounded in the scoop so I'm pretty sure I'm putting a good 3 ½ to 4 Tablespoons into each muffin well. The muffin wells in my regular muffin pans each hold 3 ounces by volume. This post is hanging with the chicks at the Clever Chicks Blog Hop, Tasty Tuesdays, What's Cookin' Wednesday, What's In The Box, and the From The Farm Blog Hop. The final batch, in the snow, making its debut at the coffee. The only thing better than a delicious muffin is...one with wholesome ingredients. These look lovely! These look amazing, Kirsten! Chocolate and raspberry are the perfect combo. I know, right? Though chocolate and just about anything is also a great combo. You did it again – fabulous! I love the barely pink that you can still see despite the cocoa. And you certainly can't go wrong with chocolate and raspberries. Now I know what I can do with the frozen raspberries that no one likes in their smoothies. :) Thanks! How could someone not like a raspberry in their smoothie? The horror! My spouse's favorite smoothie at Jamba Juice in Hawaii was blueberries and raspberries and I think a bit of lime. Yum! 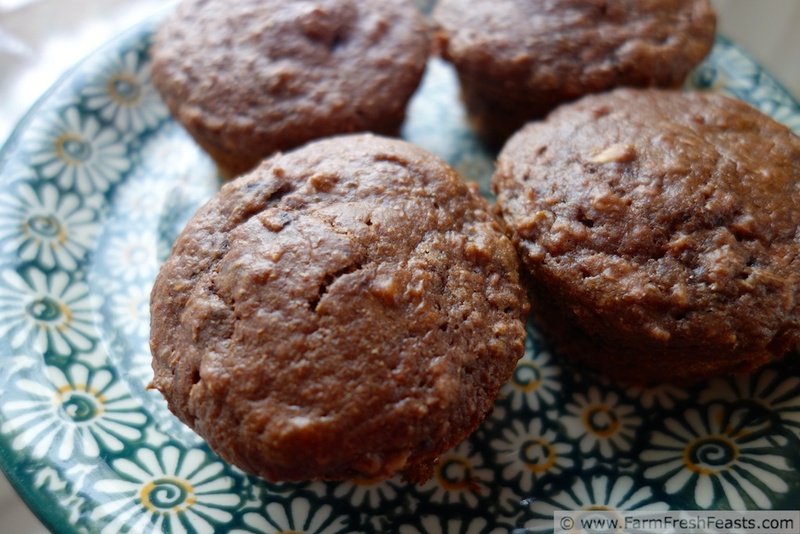 I love your standard soaked oatmeal muffin recipe and will absolutely be making these. The raspberries are for me, and the double chocolate is for the Hubby, although I suspect I will get some enjoyment from it too. I love this one and your greased stained fact sheet. How funny--in my household it would be the reverse. The raspberries for my spouse, the double chocolate for me! Yummy! Raspberries and dark chocolate are such a wonderful combination. 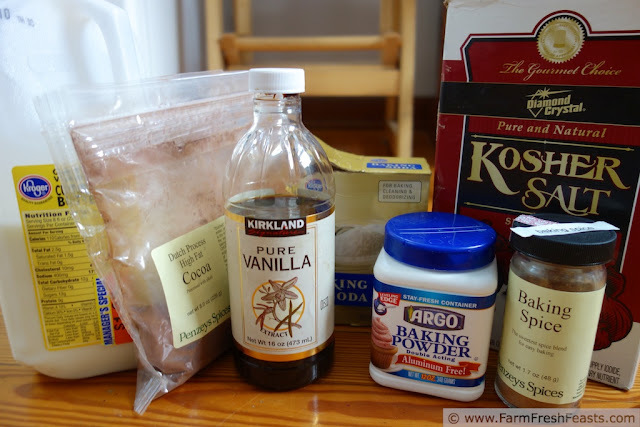 Hopefully in a couple weeks I'll be combining those ingredients to make a cheesecake. I've got the big plans, just need the raspberries to be fully in season here! I hear ya about big plans. I'm delighted to say that the strawberry patch is mostly ignored by the chipmunks this year, so I'm actually putting up berries. How cool is that? Last year we got to enjoy nearly all of the raspberries, too, but I don't want to presume that the Certified Wildlife will ignore them again this year. Wow. I am looking forward to trying these soon! These muffins sound right up my ally. I should do a batch with white flour (all we own) and wheat and do my own taste test to see if the boys baulk. Heather, that's a great idea (not the time warp, though my kids were discussing Dr Who as if they knew all about it, and that made me laugh this morning). Please let me know what their verdict is. Oh my, raspberry chocolate muffins, I don't think it gets better than that. This will be a recipe to try for sure. Thank you for sharing with the Clever Chicks Blog Hop this week; I hope you’ll join us again! Yes, down with the tasteless January store tomatoes & long live these double chocolate raspberry muffins! :) Delicious! Thank you so much for linking up with me this week at Tasty Tuesdays! I’ve pinned this & shared it with my followers! Thanks so much for pinning, and for hosting! I am completely sold on these. Chocolate and fruit...is there any better combo? Chocolate and ice cream, mint and chocolate, PB and J . . . Bert and Ernie . . . there are lots of amazing combos out there!